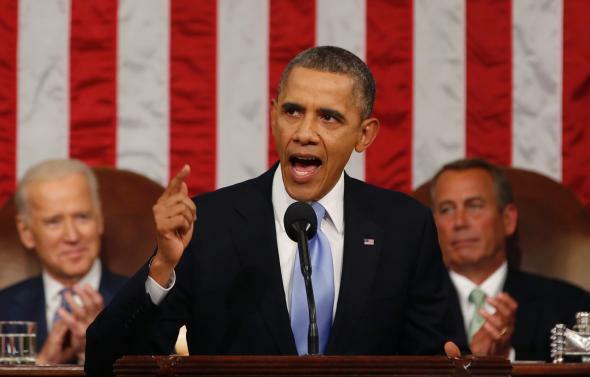 Obama’s State of the Union message: The free market vs. the work ethic. Obama is betting that Americans will side with labor over capitalism. He’s right. President Obama delivering his 2014 State of the Union address. The central word in President Obama’s State of the Union address wasn’t equality or opportunity. It was work. People will tell you this was a boring speech. Don’t believe them. It was a speech with a sharp edge. It distinguished the free market, represented by Republicans, from the work ethic, represented by Democrats. If that’s the debate in 2014, Democrats stand a good chance of winning. Here’s the basic idea. Many people who vote Republican don’t really believe in the free market. What they believe in is the work ethic. These two things aren’t identical. Sometimes the free market betrays the work ethic. When employees bust their tails, but the CEO gets all the money, people don’t like that. They aren’t capitalists. They don’t want a government that punishes effort or rewards sloth. But they like a government that makes sure the economy rewards work. The conventional view of Obama, repeated in last night’s Republican response by Rep. Cathy McMorris Rodgers (R-Wash.), is that he “talks a lot about income inequality.” But as a description of Obama’s speech, that isn’t quite right. Obama used the words equal, equality, and inequality just eight times. He used opportunity and opportunities 14 times. He used work, workers, working, workforce, and hard-working more than 60 times. Thirty-six of those references were directly about economic labor. The distinction is important. Most people think income inequality is fine—in fact, it’s proper—when one person works harder than another. Obama’s argument isn’t just that the economy has left incomes unequal. It’s that the economy is failing to honor work. Obama discussed various ways in which the government could intervene to help people earn a living: job training, small business loans, trade deals, infrastructure, green jobs, and construction projects. But he crystallized his work-ethic message in four proposals. Congress, give these hard-working, responsible Americans that chance. Steadily employed. Put herself through college. Never collected benefits. Not dependent. Pay my taxes. Hard-working. Responsible. The message couldn’t be clearer. Too many young people entering the workforce today will see the American Dream as an empty promise unless we do more to make sure our economy honors the dignity of work, and hard work pays off for every single American. Today, women make up about half our workforce. But they still make 77 cents for every dollar a man earns. That is wrong, and in 2014, it’s an embarrassment. A woman deserves equal pay for equal work. Equal pay is a complex problem, entangled in technical questions about what counts as equal work. But most people aren’t interested in those technicalities. To them, work is work, and unequal pay, on its face, seems unfair. Americans understand that some people will earn more than others, and we don’t resent those who, by virtue of their efforts, achieve incredible success. But Americans overwhelmingly agree that no one who works full time should ever have to raise a family in poverty. … I will issue an Executive Order requiring federal contractors to pay their federally-funded employees a fair wage of at least $10.10 an hour—because if you cook our troops’ meals or wash their dishes, you shouldn’t have to live in poverty. That’s a clear statement of the case for the work ethic over the free market. Yes, we accept some inequality. But we accept it by virtue of effort. By the same token, we don’t accept poverty-level wages for people who work. We draw a line against the laws of supply and demand. There are other steps we can take to help families make ends meet, and few are more effective at reducing inequality and helping families pull themselves up through hard work than the Earned Income Tax Credit. … [The EITC] doesn’t do enough for single workers who don’t have kids. So let’s work together to strengthen the credit, reward work, and help more Americans get ahead. That’s the debate ahead. Can the free market be trusted to lift working families out of poverty? If not, should the government step in? Ultimately, do most Americans believe more in capitalism or in labor? Do they see government as a threat to freedom or as an ally of honest work? For more than 30 years, Republicans prevailed in that debate because people had lost faith in government. But what happens if they lose faith in the economy? When the free market stops serving the work ethic, look out.